Cut onions in 1/4-inch (5 mm) thick slices; separate into rings. In shallow dish, combine breadcrumbs, cheese, basil, oregano, salt and garlic powder. In separate shallow dish, lightly beat eggs. Dip onion rings in egg to coat, letting excess drip off. Dip into breadcrumbs, pressing lightly to coat. Place on large parchment paper-lined baking sheet. Bake in 350°F (180°C) oven for 20 minutes. 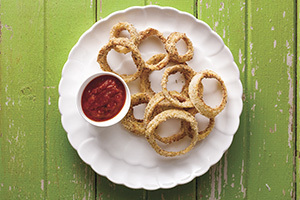 Turn onion rings over. Increase oven temperature to 425°F (220°C) and bake another 15 to 20 minutes until tender yet crisp. Serve with salsa. Serve fresh inspiration every day! Foodland Ontario helps you choose fresh food from close to home, all while supporting local farmers and businesses.